Access your purchase history and payment details anytime anywhere. Link a credit or debit card and top-up your PayPal account. Withdraw your funds. All within a single account. It’s your money. Choose how you want to spend it – by card or PayPal balance. Flex your payment power. Add your credit or debit cards and choose which one to use. No credit or debit card? Top up your PayPal account to shop online card-free. Everything you need is right there in your account profile. You can customise your profile just the way you want it – notifications, credit cards, mobile quick checkout and more. Make use of the PayPal app. You'll be able to send and request money, check your balance and transactions, wherever you go. Enter your email address used when you created your PayPal account, and we'll help you reset your password. 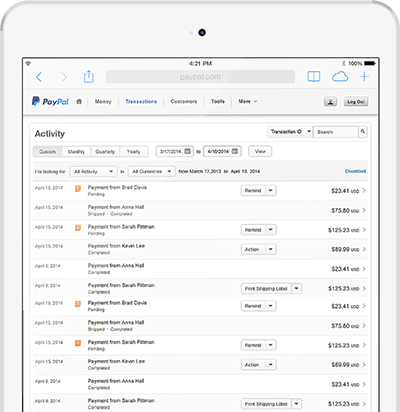 You can add a credit or debit card to your PayPal account to make payments. Log in to your PayPal account and go to Profile, select Add or Edit Credit Card. Top-up is a PayPal feature that allows you to transfer funds from your bank account to your PayPal account. It's an additional way for you to pay for online purchases more securely using PayPal – even without a credit card. You must add your bank account to your PayPal Account prior to top up, and the name on both your PayPal and bank accounts must match, otherwise the top up transaction will fail and your bank may impose a fee on you. PayPal may ask you to confirm your bank account after you’ve added it. Although we encourage you to do so to ensure your bank account is properly added, you don’t need to complete that in order to top up. After you have added the bank account to your PayPal Account, you can initiate the top up, either at a bank branch or through your bank’s online system. Learn more.